Has the RHI Inquiry got you hot and bothered? Do you wonder if it’s working as efficiently as it might be? Like, why did it take so long to get going? Why does the person being questioned sometimes sit sort of to the side of Sir Patrick Coghlin, rather than directly opposite? 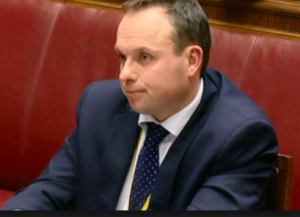 Why does Andrew Crawford (DUP SPAD) look more like a pudgy 14-year-old than a man with a doctorate, and who, it was calculated in 2015,was earning ‘in the range £59,037 to £91,809’ ? You’re probably itching to know how much Sir Patrick himself earns? ( He got the good knight thing when he was appointed a judge of the High Court of Justice of Northern Ireland. Apparently a judge of the High Court of Justice NI might as well walk around naked as not have a Sir before his name.) But the answer to your question is, I don’t know how much he earns. Yes, it’s your money he’s getting, and mine, but I still don’t know. The Inquiry in total is supposed to cost about £5 million, but how much of that heads into the good knight’s coffers I don’t know. Like yourself, I’ve watched little bits of the Inquiry and for such a hot topic, it seems deadly dull. No sign of the good knight peeling off his coat and suggesting to, say, Dr Andrew Crawford that if he fancied his chances, just step outside and we’ll see. No. The most threatening thing offered has been Sir Patrick giving a small sigh and raising his eyebrows from time to time. So here’s my suggestion. There should be a big electronic board on the wall. Every half-hour, each person in the room should receive a rating showing how they’re doing. This could be sub-divided into things like ‘Sense of Humour’, ‘Hairstyle’, ‘Posture’, ‘Consistency’ and ‘Overall attractiveness’. However, the one I want to focus on here is Consistency. That is, the degree to which the people in the room don’t contradict themselves. This will be largely confined to the subjects under cross-examination. In recent weeks, for example, Andrew Crawford would have come a cropper if we’d applied the Consistency criterion to him. He didn’t contradict himself during any one given session, but he did contradict himself when he was a SPAD. At the time of the Cash-for-Ash scandal, Dr Crawford was alleged to have exerted influence to keep the dumb RHI scheme going. All this drove him to announce that he was resigning because he was becoming the focus of the story rather than the heating scheme itself. So far so good. But then, in a letter to the officials who would decide under what terms he left, the good doctor changed his story: in it he said he was quitting in order to campaign for the DUP in an election. The result was that he got a golden handshake worth £34,000, something he wouldn’t have got if he’d resigned because he was becoming the focus of the story. The DUP says there’s no inconsistency between the two reasons but it does look as though the good Dr Crawford got some money for old rope. Then there was that communication with Peter Robinson’s son, Gareth. Having told the Inquiry that he wasn’t in the habit of sending confidential information to members of the public, it turns out the good Doctor Crawford sent an email, with a legal letter attached, to Gareth Robinson, about a planning strategy that was the subject of an ongoing legal challenge. He also sent details of some changes that were being considered in the RHI to family members who had poultry interests. Is there a pattern developing here? Two final points worth noting. The good Dr Andrew Crawford is currently working for the DUP. No information gained through the Inquiry can be used in a future prosecution. A bit like going to Confession, then.